Avène Cleanance Cleansing Gel gently cleanses, removes impurities and controls excess oil without disrupting the skin’s natural barrier or pH. Ideal for oily, blemish-prone skin on the face and body. Key ingredients include Monolaurin that mattifies and regulates hyperproduction of sebum. Rich in the signature Avène Thermal Spring Water known for its soothing and anti-irritating properties. Soap-free. 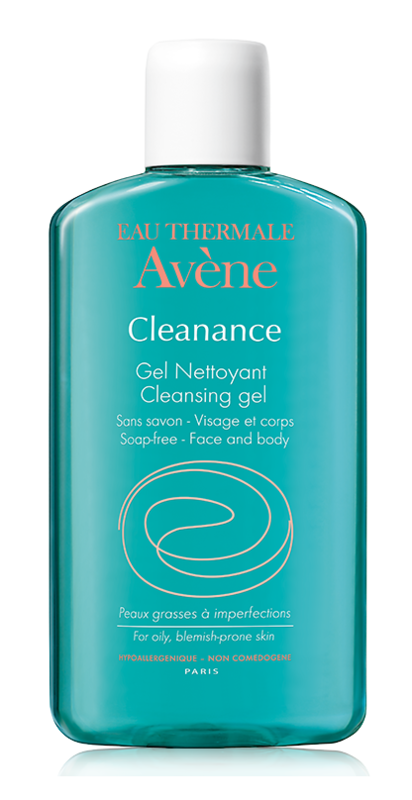 Dr. Webster’s Recommendation: Avène Cleanance Cleansing Gel performs well as a daily cleanser for treating oily, blemish-prone skin on the face and body. Its non-drying and non-stripping formula complements other products in a skincare routine designed to target acne for both teenagers and adults. It provides both a mattifying and soothing effect. Apply twice a day to wet skin, work up a lather, rinse thoroughly then pat dry.